Another day in the sun, another day on the bike, another day hanging off the back – now I know what Brian feels like . 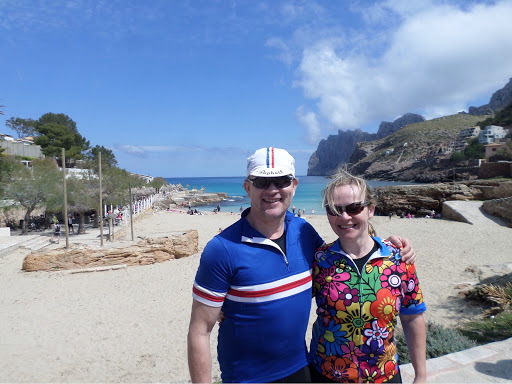 . .
Today we cycled up to the lovely cove of Cala Sant Vincenç where we stopped for a lazy repast of the filled buns robbed from the breakfast bar. Given the Germanic nature of breakfast this is better than it sounds, i.e. salami and cheese rolls. We are living up to the SBCC skinflintyness standard in this regard, or is it an over 50s national stereotype – votes on a postcard please. 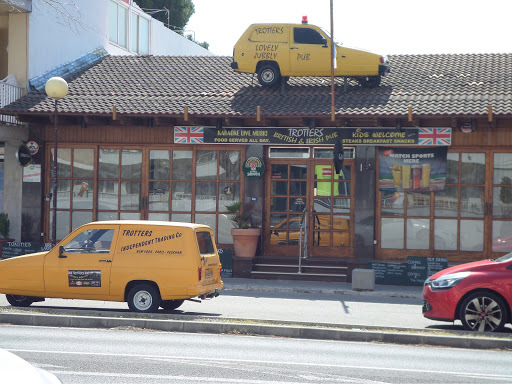 Talking of stereotypes we have found a great bar to go to tonight . . .
S has been feeling the strain, with persistent neck ache bordering on migraine. The chiropractor was meant to have sorted it out despite my misgivings along the lines of: “What are doing seeing those bloody quacks for, you need a proper physio who will put you into excruciating agony . . .” That will teach me to keep my mouth shut, because I have now acquired the role of S’s personal soigneur, having to massage her knotted muscles at every stop and break – my thumbs have had a better workout than the legs . . . But at least S got to wear her new shirt for the first time – if she falls off her bike into a flower bed we will never find her. Lou and Greg have been taking the group selfies – see alternative Facebook (other social media sites are available) posts for information. In a moment of philosphical musing on the nature of infinity, I took it upon myself to take a selfie of the selfie, much like holding up two mirrors in opposition to one another and wondering where it ends . . .
On that profound note I am signing off.